Tigers Kickoff 2011: The best Auburn magazine edited inside a neonatal intensive care unit ever. Way back in the hazy afterglow meets anxiety that was the pre-season of 2011, TWER (with a little help from the outside) put out a magazine. 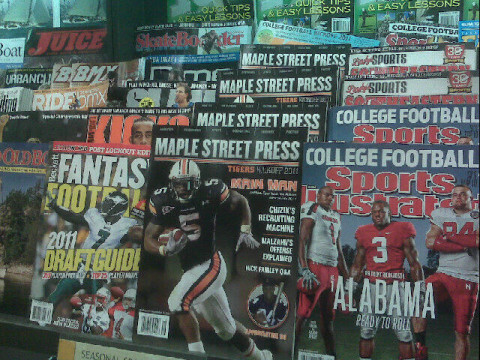 And in that magazine was a 3,000 word breakdown of the Gus Malzahn offense written by football uber-guru Chris Brown of SmartFootball.com (which you should visit today and for always). And what with Gus Malzahn (via his disciple) now completely controlling play calling on the Plains, it seems like a good time to revisit Brown’s preternatural insight on the hurry-up no-huddle, if not for the hundreds of thousands of Auburn fans who bought the magazine and still have it at the ready on their nightstand then for the few of you who didn’t. By now, Gus Malzahn’s story is well-known. Malzahn, a high school coach known for his high scoring offenses and talented players at Springdale, Arkansas, thought he was getting his big break into Division I coaching, when Houston Nutt hired him to be his offensive coordinator at Arkansas in December 2005 (so long as he brought several of his players and his quarterback, Mitch Mustain, with him). Malzahn installed his up-tempo no-huddle offense, only to have Nutt junk it after they got slaughtered in the opener by a Matt Leinart/Reggie Bush Southern Cal juggernaut. Arkansas had a very successful 2006 season and won the SEC Western Division, but by the end of the year it was clear that the Malzahn experiment would not be repeated. It appeared that this “high school coach” had reached his limits; end of story. Except that it wasn’t. Malzahn was offered the offensive coordinator job by Tulsa’s Todd Grantham and for two years led the Golden Hurricane offense to record-breaking stats — Tulsa became first team in NCAA history to have a 5,000-yard passer, three 1,000-yard receivers and a 1,000-yard running back in the same season— before jumping to become an Auburn Tiger. In the four years since he left Arkansas his offense has finished in the top in total offense three times. (The other year, Malzahn’s first at Auburn, the Tigers finished 16th in total offense, substandard for Gus until you remember that it represented a ninety spot increase from the 106 offensive ranking in Tuberville’s final season.) But in his second year at Auburn, Malzahn helped the Tigers accomplish something beyond statistics: a dream season with multiple comeback wins (including, most gloriously, against the fighting Nick Sabans of Alabama), a Southeastern Conference championship and, finally, a National Championship. Not bad for a high school coach. While 2010 will be remembered for Gus’s gutsy calls and fanciful schemes, those memories are inseparable from Auburn’s incredible triggerman: Cam Newton. As evidenced by the NFL– despite the whining about the dangers and inferiority of the spread offense – putting its money where its mouth was by making him the number one overall pick, Cam appeared almost genetically designed to run Malzahn’s offense. And, most impressively, as the season went on Cam Newton got better. While Cam’s immense physical talents were apparent immediately, his ability to read defenses, understand the concepts Malzahn presented, and to take charge of the team were hard won in comeback wins over Clemson, South Carolina and Kentucky, in hard fought SEC battles against LSU and Mississippi State, and, of course, on the road at Alabama. His mastery of Malzahn’s concepts became obvious (if it wasn’t already) in the SEC championship game rematch against South Carolina, and in the resiliency shown in gutting out the championship against Oregon, a team that, like Auburn, had earned the right to be there and didn’t want to go home a loser, but did. Indeed, one of the interesting changes in Malzahn’s reputation is the evolution from being known as a pass-happy guy to a run-first coach; Auburn’s offense last season might have been spread and no-huddle but it was a power based offense. With no proven quarterback, the loss of receivers like Darvin Adams, but a dynamic and stable backfield with Michael Dyer and Ontario McCalebb, the emphasis will be on the run game. The foundation of Malzahn’s running game is the “power” play, or scheme. It’s not a novel scheme (and I think coaches love it as much for the name as the play itself) — it’s probably the second most popular scheme in the NFL behind only the basic zone blocking schemes (Gus runs those, too). Power, in its base form, is simple. The play side of the line – where the runner is going to – blocks “down,” meaning the offensive tackle does not block the defensive end but instead double teams the defenders inside of him to crush those guys, get movement on them, and to create a wall of blockers to cut off the backside. The hole for the runner is created by the fullback who “kicks out” the defensive end – this is not an easy block, but it also doesn’t have to be a pancake; all the fullback needs to do is seal off the end. The runner bursts through the hole, but not without some assistance: the backside offensive guard (who lines up just to the center’s left), “pulls” and leads the way as a lead blocker. The running back is instructed to follow the guard’s block and then cut off of him, i.e. run right behind him, using the block as a shield to spring into the secondary. This is just the kind of base run play that Malzahn likes: adaptable, flexible, but powerful. Expect Michael Dyer to wear down defenses exactly this way, with the big runs occurring in the second half. But don’t forget — it’s adaptable; indeed, who was Auburn’s best inside runner last season? Cam Newton. Malzahn found a way to combine the power blocking with an option play and his uncanny knack for putting players in position to succeed through one of the great spread-offense wrinkles of the last five years: the inverted veer. The “veer,” one of the oldest option plays, involves the running back run inside while the quarterback reads a down lineman; if the defender he’s reading tries to tackle the running back, the quarterback “pulls” the ball from him and steps around (sometimes with an additional “pitch” read for the full triple option). If the defender sits watching the quarterback, the quarterback simply hands it off to the running back running inside. Think about those great wishbone teams from the old days or the Nebraska teams from the 1970s: they hit you with option pitches and quarterback runs until – suddenly, and somehow – the fullback would blast up the middle for fifty yards untouched. That was the veer. Malzahn’s innovation (though to be fair, the first team I saw do this was TCU in 2009) was to invert those guys by having the running back run outside while the quarterback was the inside threat. And Malzahn did it all with “power” blocking. As the above shows, the only difference in terms of blocking is the removal of the fullback blocking the defensive end, which is unnecessary because the quarterback is now reading the defensive end. The rest is the same: the play side of the line blocks “down” while the backside guard pulls and leads into up to the linebacker. But the backfield action completely changes. The running back – typically McCalebb – runs laterally past the quarterback to threaten a wide sweep. The quarterback reads the defensive end: if he fails to widen for the sweep (and he must to account for McCalebb’s speed) it’s a simple handoff sweep, one that often went for big yards last season. But if the defensive end does widen, the quarterback simply pulls the ball back and shoots up inside, now acting as the runningback and cutting off the block of the backside guard. This was probably Auburn’s best play last season; indeed, almost all of Newton’s big runs (including electrifying ones against South Carolina and LSU) came on this play, especially as Cam learned to cut back after getting into the thick of the defense (and, you know, the part where he juked four guys and ran over a couple more? Pure coaching….) 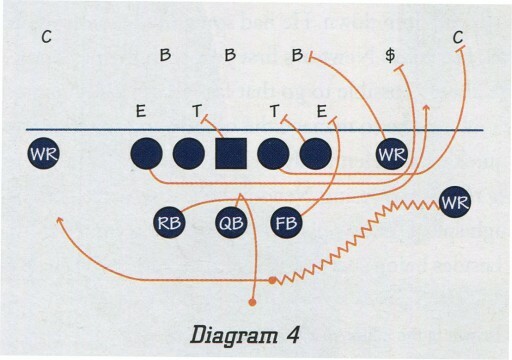 Moreover, Malzahn often called the same play on the goal line but instead of from a four wide receiver set (as in the above diagram), used multiple tight-ends, and then let Cam either knife through the defense or leap over the pile into the end zone. Obviously, whoever Auburn’s quarterback is this season won’t have the kind of speed and athleticism Newton had, so this play likely won’t get nearly the emphasis it did before (though it will still be part of the package). The trick will be how to use this same blocking scheme but without such a dynamic runner at quarterback. Ironically, the solution may be to run more option. Malzahn has a couple of different ways to run the old “speed option,” where the quarterback runs down the line of scrimmage until the unblocked defender goes to tackle him, at which time he pitches the ball out to a runner who (hopefully) bursts down the sideline for a long touchdown. If your quarterback is a legitimate runner you use this play to put the “threat” in dual-threat; if your quarterback isn’t a big run threat you use it more as a cheap, or inexpensive, way to get the ball to a runner in space on the outside. Note, again, the overlap with the blocking schemes: down blocks on the playside, with the fullback on the defensive end and the backside guard pulling. This time, however, the fullback attacks the defensive end’s outside shoulder; this is a good counter play if the defensive end has been pinching inside hard for the traditional power play. The backside guard, too, knows the play is actually attacking to the outside, so he changes aim. For the backfield, Malzahn does it one of two ways. Sometimes he simply has the running back run outside the quarterback to be in a “pitch relationship,” so that when the quarterback is threatened he can pitch it to the runner. 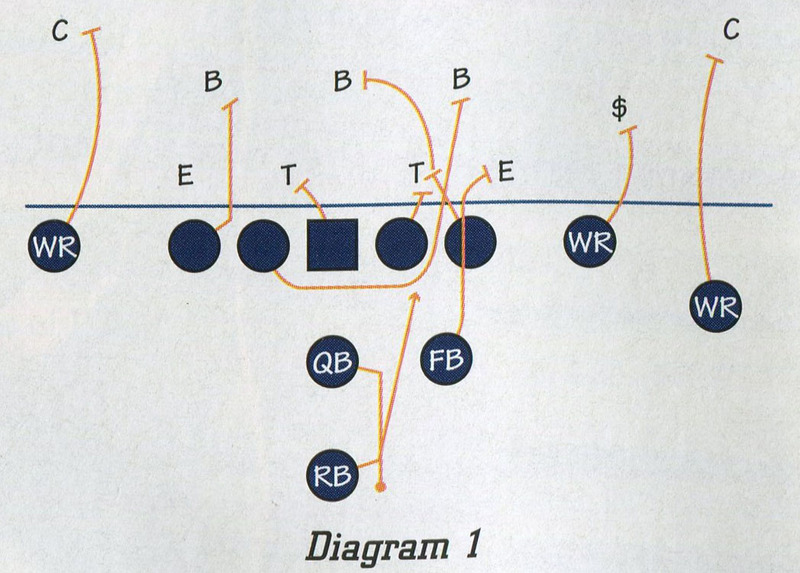 The other variation, as shown above, has the quarterback actually fake the run play to the running back on power, but then pull the ball and run the option path. Because the running back runs inside, the “pitch player” becomes the wide receiver who has motioned around and behind the running back and quarterback (known as “orbit motion”) but then pivots and runs back to the same direction he came from. Note that Malzahn has no problem putting Dyer at running back and using McCalebb in this orbit position; it all depends on where the talent is. This is a perfect play for a quarterback who is smart, but not as athletic as Cam Newton – it’s more about good fakes and decision making and getting the ball to the playmakers in space. Malzahn has had lots of different types of quarterbacks, and he certainly knows how to use them. Despite not having a true runner at quarterback, I expect Malzahn to use lots of option this fall. These traits go back to Gus’s high school days. As Malzahn explained to Sports Illustrated before the BCS title game last fall, when he was promoted from defensive coordinator (!) 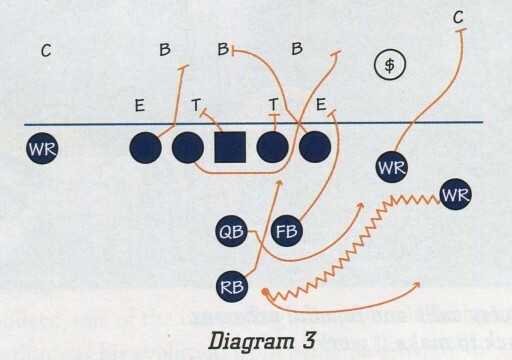 to head coach at Hughes High School in Arkansas in the early nineties, he bought the book The Delaware Wing-T: An Order of Football – a coaching classic – and “went by it word-for-word.” The book described the Delaware Wing-T in ways any coach could understand and install, and it was the perfect training for modern football. The Wing-T was one of the oldest and best offenses for a long, long time, and the “Delaware” spin was put on the offense by Deleware’s Harold “Tubby” Raymond. The offense is built around misdirection, leverage, angles and fakes, and is designed to both spread the ball around and utilize players in ways that maximize their talents – sound familiar? That the offense was under center and used two true running backs and a halfback rather than the multiple formations, shotgun and multiple receivers Malzahn would come to favor is mere detail, not primary substance. The Delaware Wing-T, essentially unchanged, was the offense Malzahn ran for years until the rise of the spread offense when he married his Wing-T concepts with the nouveau spread. At the college level his offense came together during his time at Tulsa with co-offensive coordinator Herb Hand, a Rich Rodriguez disciple (who now coaches at Vanderbilt). 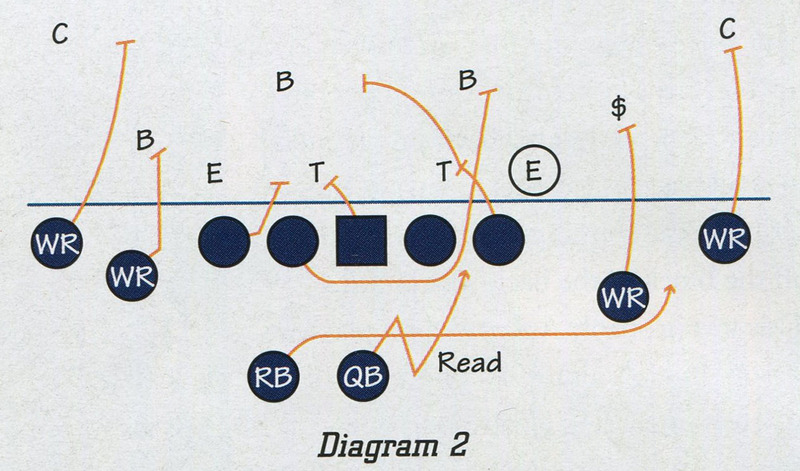 But despite the evolutions, many of Gus’s best plays still find their roots in the Wing-T. Since he was at Springdale, Arkansas, Malzahn has been running a version of the old Wing-T “buck sweep” (also sometimes called the “truck sweep”) from the shotgun. Most teams don’t use it because it’s a somewhat slow-developing play to the outside, but Herb Hand once mentioned to me that it averaged more than 10 yards an attempt at Tulsa for a full season. And for Tigers fans the evidence is even more immediate: In 2009, Ben Tate racked up over 1,300 yards rushing, many of them on this very play. The “buck” or “hand sweep” is classic Wing-T: The line, tight ends, and receivers all block “down,” or step to their inside to get an angle to cut off defenders’ pursuit, while both guards pull and lead to the outside. Note that, although the blocking is different, it’s not that different from the power play previously described; the line still blocks down and, other than the play side pulling guard, looks essentially the same. One difference is that the slot receiver blocks down, but hopefully (for the offense) the guy he’s blocking will never even see him, resulting in a pancake. Meanwhile, the quarterback executes a fake, causing the defense to hesitate just for a moment, and there goes the runner. 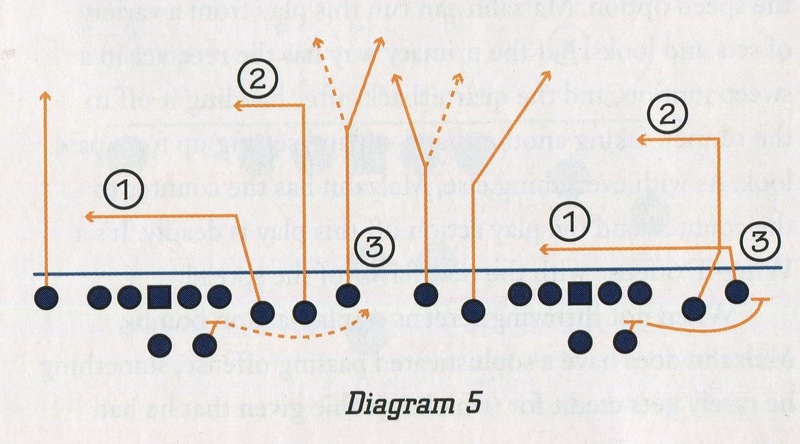 And if the generic buck sweep is classic Wing-T, the Auburn version is classic Malzahn, an age-old concept combined not just with the shotgun but with a funky formation and receiver motion – the same “orbit” motion used in the speed option shown above. (And of course a couple of times a game he simply calls the reverse to the receiver snaking around.) Malzahn can run this play from a variety of sets and looks, but the primary way has that receiver in a sweep motion and the quarterback, after handing it off to the runner, faking another hand-off and setting up for a pass look. As with everything, Malzahn has the counter to the counter, and the play-action off of this play is deadly. Wing-T offense with the new flavor of the spread. On the play, one receiver runs a shallow cross at around five yards – attacking upfield for a couple of steps before breaking across the field at four-to-six yards deep – while another receiver runs a 10-yard square-in looking to either run away from man-to-man coverage or to settle in a window between defenders against a zone. 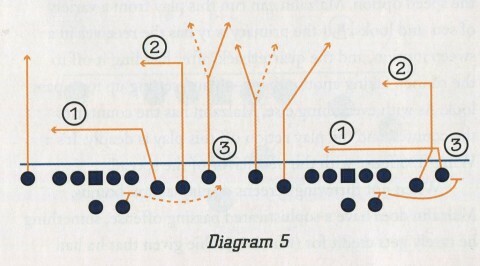 Auburn tended to run it from both a three receiver to one side set (“trips” or “trey”) and a two-by-two set, each shown in the diagram. 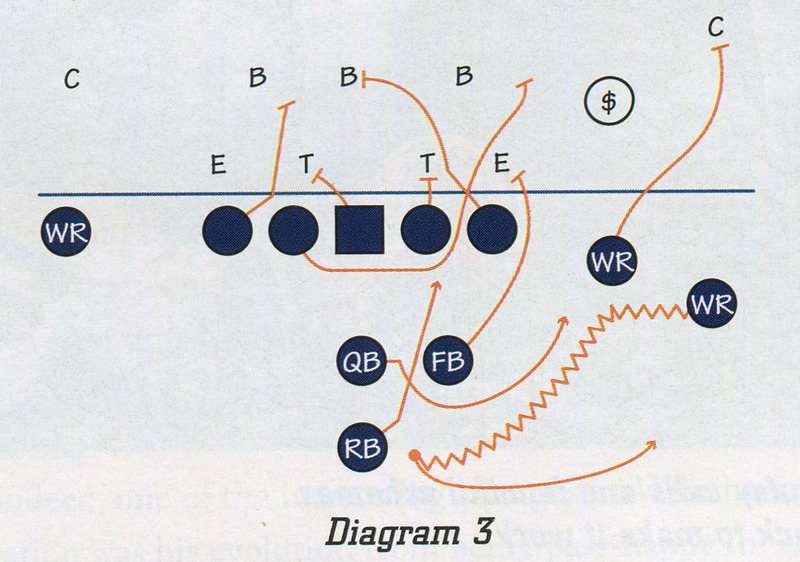 One of the beautiful things about the play is how simple the throw is: Quarterback takes a simple drop and can deliver the ball to a receiver on the run on the shallow cross. And once that’s taken away, the square-in should open, but the read will be evident because the foundation of the play is throwing that short crossing route. The play also has built in answers against blitzes, thus alleviating some of the complicated pressure that can arise on a quarterback trying to diagnose and attack zone blitzes and other bizarre pressures that the great SEC defensive coordinators like to throw at young quarterbacks. Moreover, the defense still has to respect the big play; if they blow a coverage or play tight, press-man there are multiple receivers running deep “go” and post routes. Particularly in the two-by-two set, the quarterback can just as easily look to the two deep receivers for any voids in a zone or a mismatch from a wide receiver who beats his defender off the line of scrimmage. Just as he did with Newton, I expect Malzahn to use this play as a confidence builder for the young quarterbacks as they learn to play at SEC speed. Remember, he’s coached quarterbacks who threw for 5,000 yards as well as ones, like Newton, who could run over you. But the biggest advantage a young quarterback has in playing for Gus is the real foundation of the Malzahn attack: the tempo. The schemes are important, of course, but the stuff Malzahn really cares about is tempo, aggressiveness, speed, and rhythm. Again, his entire offense is built to run from the no-huddle – at ever shifting but always fast speeds – and now, in year three, I expect Auburn to run more plays than ever. In year one, Malzahn had to substitute often to get what he wanted, thus slowing him down. He had some of the same issues last season, but it was Newton’s first year with the program — it wasn’t always possible to go that fast. This year, whoever the quarterback is, their job will be to manage the offense and to distribute the ball quickly and relentlessly. What Malzahn lacks in speed during the play by losing Newton he will attempt to gain back through speed between plays. It’s a relentless approach to offense and, besides being successful, it’s also relentlessly fun. Related: ‘It’s like talking to a beautiful woman’: a phone call with Gus Malzahn. the same article/chapter is also in Brown’s book, which is excellent. Ahhh, the irony of expecting Gustav to run more plays than ever and increase the tempo in 2011… There’s part of the story of the beginning of the end for Gene Chizik as head coach, right there. I’m loving seeing Auburn picking up the pace. This offense is already something special, and it hasn’t even come close to hitting as fast as Gustav probably wants it to go.